"Making her Canadian debut, at the age of fourteen, Danielle Akta is a thrill to watch. The music seems to take her over, like a trance - her eyes closed, she breathes it in and exhales it through her cello. Akta is a magnificent musician, a true prodigy. In Bruch's "Kol Nidrei op.47 for Cello and Orchestra", Akta played passionately - followed by Popper's "Concert Polonaise, Op.14", which allowed her to have more fun, showing off her technical agility." 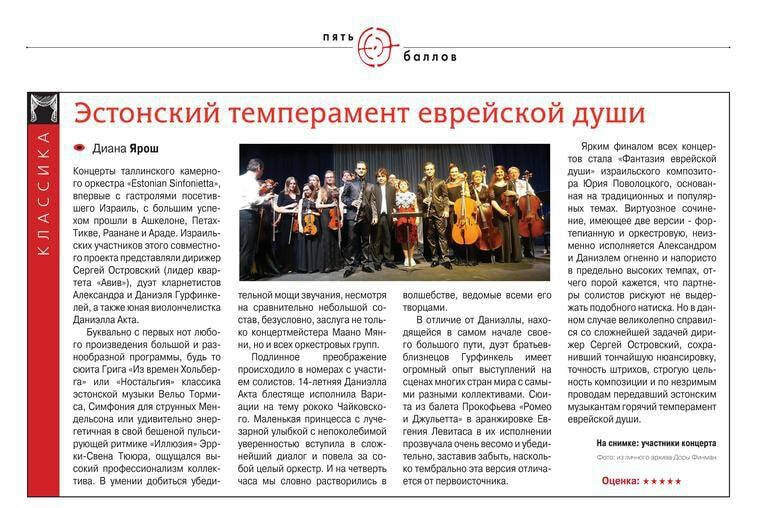 "Then it was the first guest soloist of the evening, the 14-year old Israeli cello phenom Danielle Akta, playing Max Bruch’s Kol Nidrei, Op. 47. What a fabulous talent! Possessing the technique of a super-virtuoso is a given these days, but she also has uncommon musicality in everything she does, drawing the most exquisite, warm, caressing, singing tone from her instrument. I loved her unbridled joy of music-making, so clearly written all over her face. Hearing her was an unalloyed pleasure. Her second piece was the Concert Polonaise Op. 14 by Czech composer David Popper, a highly romantic, happy work with the typical polonaise rhythm. 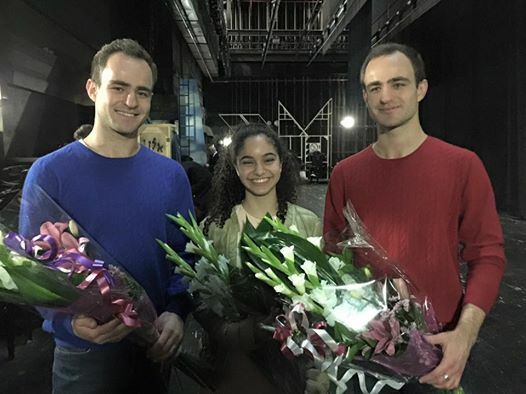 It certainly put the audience in a great mood, and Akta received huge ovations." “después apareció en el proscenio del Teatro Juárez la solista Danielle Akta, de apenas 16 años para dejar asombrada a la audiencia desde el primer acordé. 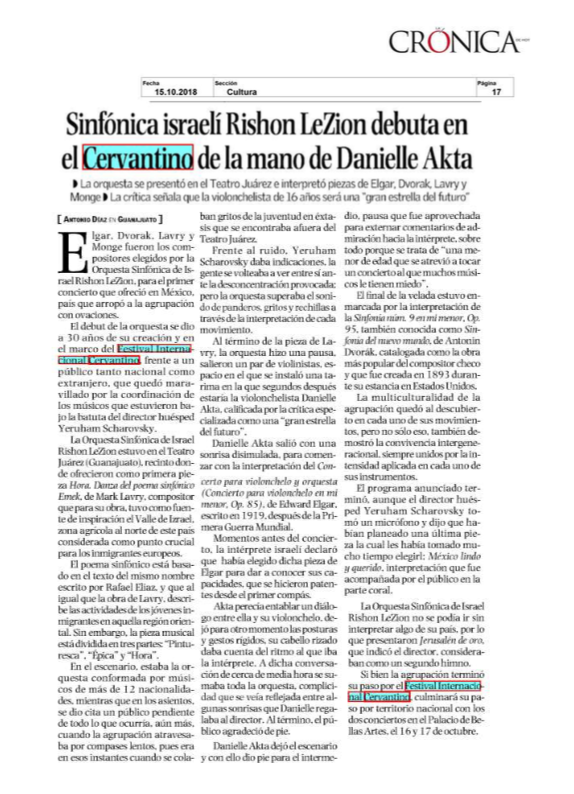 La brillantez y energía que imprime en cada nota musical es increíble, sin duda el haber tocado el concierto para violonchelo y orquesta en mi menor Op. 85 del británico Edward Elgar fue un gran acierto. Los cuatro movimientos: Adagio Moderato, Lento Allegro molto, Adagio y Allegro Moderato allegro man non troppo poco piu lento adagio fueron ejecutados de manera perfecta por esta niña prodigio que sin duda tendrá una amplia carrera en el mundo de la música." 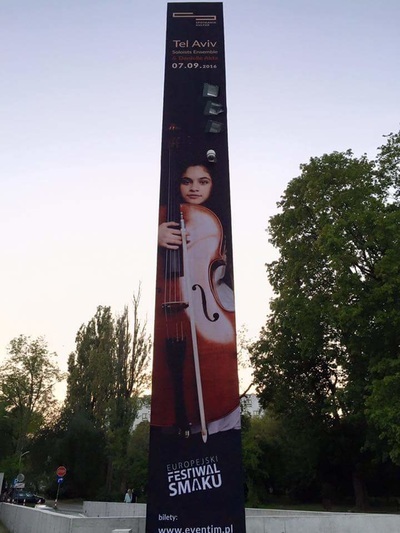 "The evening also featured teenaged cellist Danielle Akta. Smiling with joy, Akta made her instrument both sing — with a big vibrato in Bruch’s Kol Nidrei, Op. 47 for Cello and Orchestra — and dance, with fired-up fingerwork in David Popper’s Concert Polonaise, Op. 14 for Cello and Orchestra. " 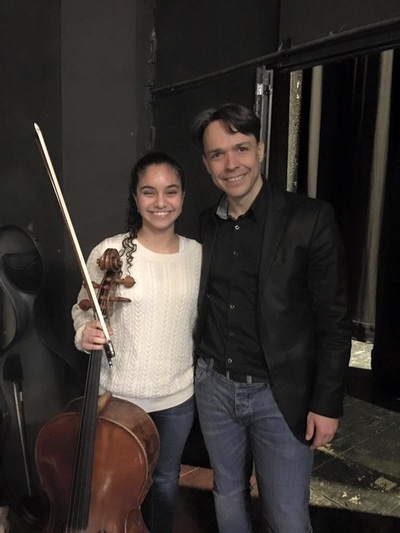 "Things got even richer for Bruch’s Kol Nidrei where the orchestra was joined by 14 year old Israeli cellist Danielle Akta. The orchestral sound was sumptuous here but the real star was Ms. Akta. One expects virtuosity from the sort of young musician who tours with a major orchestra but one does not necessarily expect the kind of intensity that we got from Ms. Akta. She played as if she had the sort of life experience one would simply not wish on a young girl. Her instrument, an Orselli loaned by Dr. Moshe Kantor, was rather wonderful too. She can do virtuoso too as she showed in the Popper Concert Polonaise that closed a very satisfying first half." 'Danielle Akta joined in on cello. She came out, looking like a kid of fourteen-years-old or so. The emotional intensity knocked the room out. I was watching the four other cellists on stage watching her. Two of them were at least double her age, yet she had their full attention. I can understand why. She took it to another level." 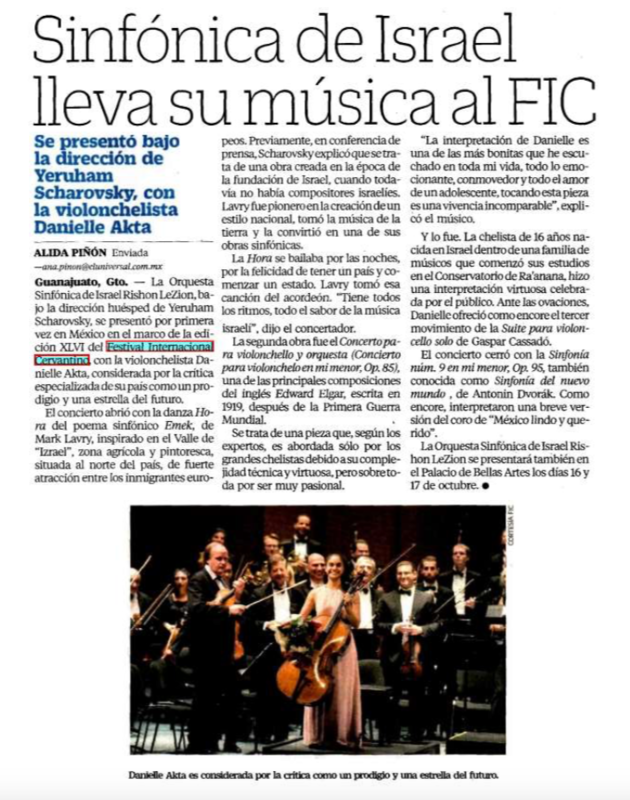 "The principal solo work of the evening was Tchaikovsky’s lovely Rococo Variations, a winsome concoction which gives the soloist considerable opportunity to display all aspects of her art. In this case, the astonishingly youthful Danielle Akta performed with an assurance that belied her teenage years and kept us engrossed with a fine account, sympathetically if not always crisply accompanied by Boico. Her bowing arm has a flexibility that ensures even and measured tonal projection and her left hand showed splendid intonational accuracy." "The teenage cellist, Danielle Akta, joined Spivakov and the Moscow Virtuosi at the start of the second half to perform a pair of contrasting works from the 19th Century. Bruch’s Kol Nidrei was composed for Liverpool’s Jewish community and it uses two traditional Hebrew melodies. Miss Akta gave an assured and richly evocative performance sustaining the line beautifully and working well with the Moscow Virtuosi. David Popper’s Shining Polonaise was dispatched with virtuoso swagger with the soloist clearly relishing the extrovert writing and rising to the occasion magnificently. Danielle Akta is clearly a star of the future." "Two cellists, one a prodigy and one a former prodigy, hypnotized. 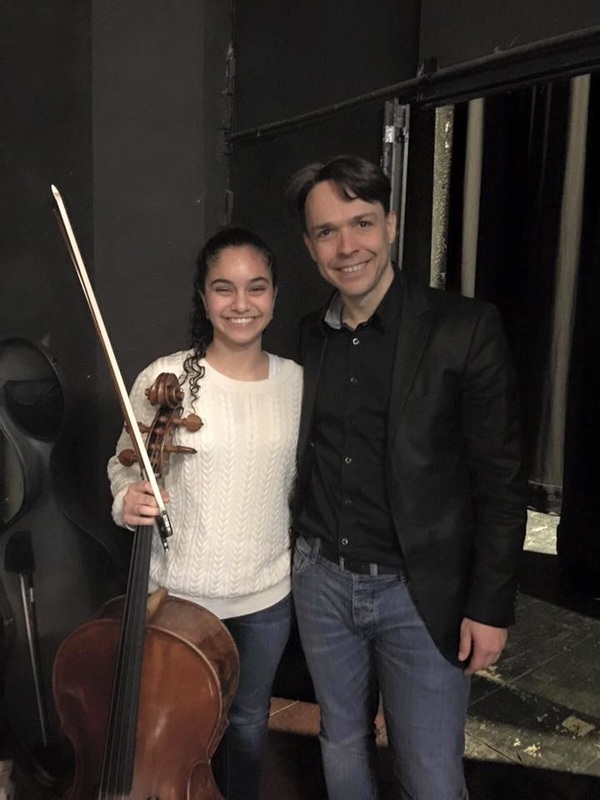 Danielle Akta (age 13) with the Jerusalem Orchestra (March 14, Troy Chromatic Concert Series) and Yo-Yo Ma with the Albany Symphony Orchestra (Dec. 8, Palace Theatre, Albany). (Freedman)"
"Артистичная Даниэль Акта, которую называют самой яркой восходящей виолончельной звездой, уже привыкла к восторгам публики и в одобрении нуждалась меньше. Непростая музыка Давида Поппера — вызов даже для опытных виолончелистов — была ей нипочем. 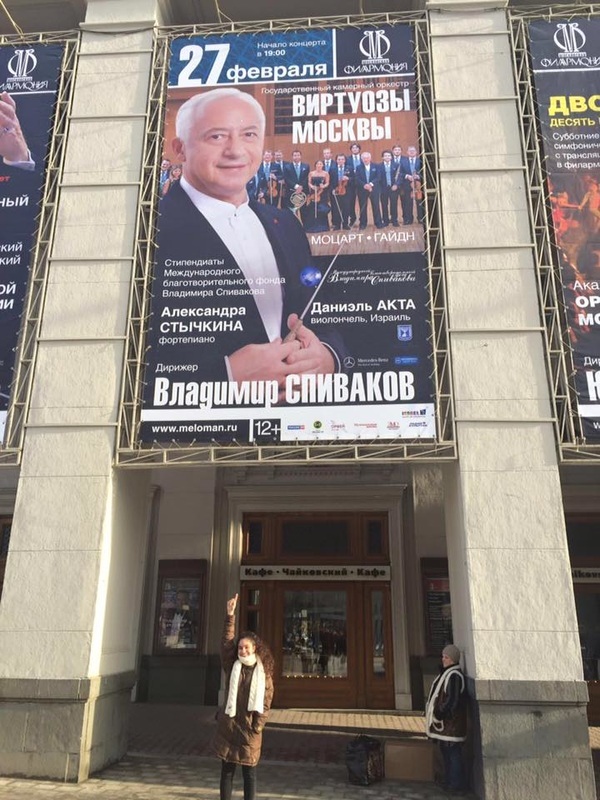 Слившись с инструментом в одно существо и раскачиваясь с ним в такт музыке, она чувствовала себя в своей стихии и задорно встряхивала хвостом из кудрявых волос, выходя на поклон." 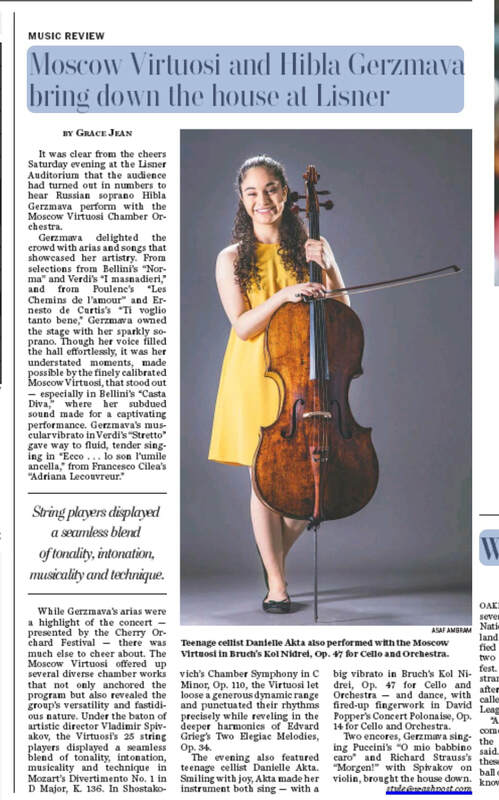 "...Program that was enlivened by a miracle of a 13-year-old cello prodigy. For her, the piece was a conversation between her cello and the orchestra. And what a marvelous talk they had. She was exuberant, technically precise even to the perfect harmonics and double stops, wonderfully musical and totally at ease, a natural performer. Yablonsky, who is also a cellist, knew how to support her. The crowd gave her a long standing ovation." 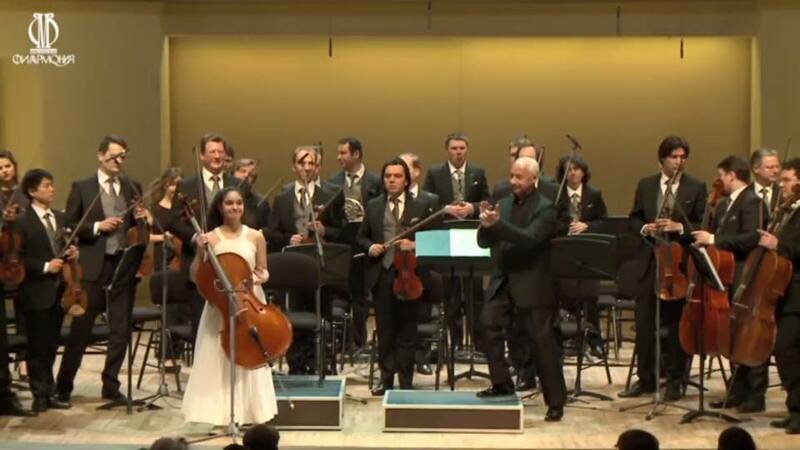 "Camille Saint Saens' "Cello Concerto no.1 in A Minor, Op.33, which followed introduced a young (13 years old) extraordinary, cellist Danielle Akta. 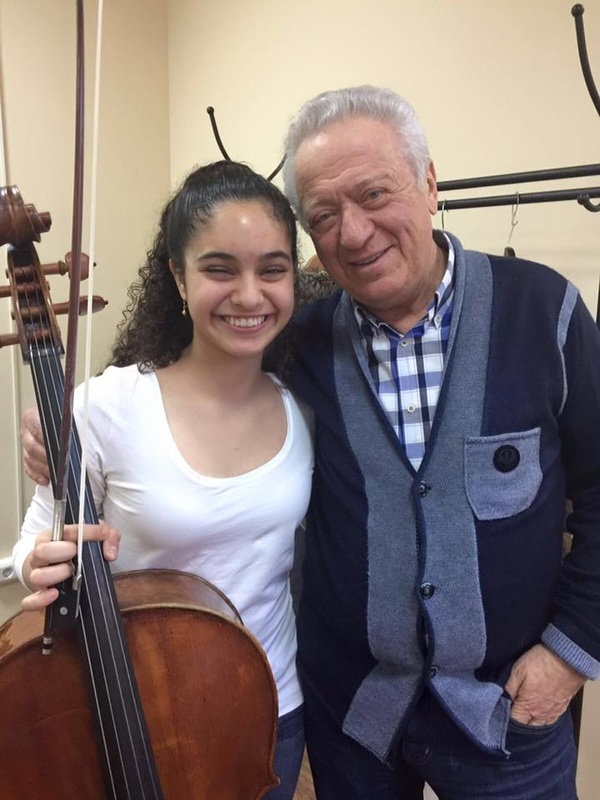 This talented, multi-award winning cellist displayed not only amazing technique in playing this challenging concerto, she also displayed extraordinary artistry and sensitivity, unusual in a musician of such tender years. Remember her name, you will be hearing much more about this fine artist, just like her inspiration Jacqueline du Pre, who motivated Danielle to study cello at the age of four. the talk of the night was not just, "what a great concert" but also "what an astonishing young cellist." "Life and vigor were on display in the Saint- Saens Cello Concerto No. 1 in A Minor, Op. 33 thanks to the efforts of 13-year old soloist Danielle Akta. The girl was so infused with music that she just couldn't sit still. But she channeled that energy into some appealing playing, with plenty enjoyable all the same." "There was more to admire, both musically and performance-wise, in the JSO’s reading of Camille Saint-Saëns’ Cello Concerto no. 1. The soloist here was 13-year-old Daniella Atka, a rightly-heralded young virtuoso who clearly knows and loves this piece. A decade hence, she may have a very different take on it, but Tuesday’s straightforward reading offered more than a few downright charming moments. Atka delivered Saint-Saëns’ lyrical writing with lots of heart. The dialogues between soloist and orchestra in the middle movement sparkled. ​Several generations back, Jascha Heifetz offered the theory that child prodigism is almost always fatal. So it seems. But if Atka proves an exception to that rule — and there are plenty of reasons to hope that she does — she appears to already possess the technical and emotional grounding requisite for success. More power to her." "The headliner for the evening was Danielle Akta, a thirteen year old cellist. The orchestra provided the perfect background to compliment the young prodigy’s talent. 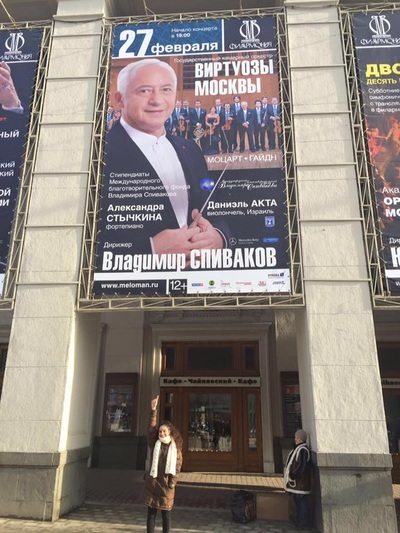 "Даниэль Акта, наша надежда в мире виолончельных звучаний, лауреат международных конкурсов, вундеркинд из Раананы, сыграла в программе молитву «Кол нидрей» Макса Бруха. Девочка с сияющими глазами, с прелестной очарованной улыбкой, она словно поет на своей виолончели, поет нежно и печально, молится в песне – и мороз идет по коже, и хочется плакать о том, что утеряно, о тех, кто не вернется... Зал во время исполнения затих растроганно и благодарно, будто музыка вернула людям живое сердце... Изысканность и грация этой литургической музыки завораживают, врачуют, просветляют."